Erin Adair-Hodges teaches poetry, literature, and composition at Central New Mexico Community College. 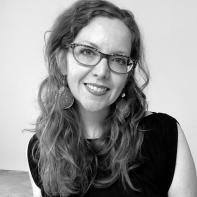 An MFA alum of the University of Arizona, she was the recipient of the 2014 Loraine Williams poetry prize from The Georgia Review. She lives in Albuquerque, New Mexico with mammals she loves. in letters hinged like blades, lightning bolts angry and bored. vibrating its need. It’s so loud you think it could rechart rivers. with the sound of you crashing in their happy ears. every few months, celebration of solstice and equinox. and his own heretofore suppressed megalomania. a burrito place we sometimes go to for breakfast. cook drugs in. It stops to let tourists out to pose. the woman is gone and then nothing happens. all the gunshots are coming. but such is the price of free will. and then sleep til the end of rhyme. because to keep living is the loneliest thing. and I am beautiful and I am alone.